Former Polish president Lech Walesa - who spearheaded the east European anti-communist movement in the 1980s - is in Kiev to try to resolve Ukraine's political crisis. One of the founding members of Poland's Solidarity trade union movement, which emerged to challenge the communist government during strikes in the Gdansk shipyards in August 1980, Mr Walesa came to symbolise the political struggle which led to the collapse of the Soviet bloc. He was awarded the Nobel Peace Prize in 1983, and in 1990 was swept to power as the country's post-communist president. But his confrontational style alienated voters, and he often embarrassed the political establishment with his bluntness and lack of sophistication. In 1995 he failed to gain a second term in office. 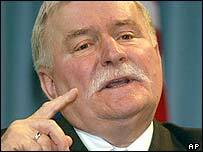 Mr Walesa was born in 1943 in Popowo, Poland, to a carpenter and his wife. He attended primary and vocational school, before he left home at the age of 16 to become an electrician. He then went to Gdansk and joined the Lenin Shipyard, quickly becoming involved in an illegal strike committee. It was in 1988 that he led the series of nationwide strikes, a year before he negotiated an agreement with the government under which Solidarity was legalized and allowed to campaign as a political party in the upcoming elections. After five years as president, in 1995 he was defeated narrowly by the ex-communist minister Aleksander Kwasniewski. He said then that he was going into political retirement, but remained active, and made another bid for the presidency in 2000. But his waning influence harshly manifested itself when he secured less than 1% of the vote. It had been a difficult campaign. Mr Walesa was accused of having worked for the communist police by spying on fellow dissidents in the 1970s, and although he was cleared of the charges in August, many Poles remained shocked by the allegations. Nonetheless, he is still regarded by many as the hero and an important symbol of the anti-communist struggle. Early in 2004, the Gdansk-Tricity international airport was officially renamed to Gdansk Lech Walesa Airport in commemoration of the city's former shipyard worker. But even this was not without difficulty; there was much debate about whether the name as it appeared in the airport's logo should be spelt with or without diacritics. He is also a regular billing on the international lecture circuit, sharing his view on the history and politics of Central Europe at various foreign universities. And he has also tried to involve himself in international crises, although so far with limited success. His offer in 2002 to lead a team of weapons inspectors to Iraq met little enthusiasm. It remains to be seen what will become of his latest venture, to mediate in the presidential stand-off in Ukraine.